The guild window is now separate from other community windows, and has been completely revised. You will need to set up a hot key in the game options to access it (we recommend G). Announcements can be written by the guild leader or anyone with the privileges to do so. They are seen by the whole guild in the top of the guild window, and also in the chat window the first time you log in or when it is changed. New privilege settings allow more freedom in giving power to your members. Set all priviliges for Officer, Veteran, Member, and Initiates separately. However, in order for a lower rank to have access, all ranks higher than it must also have access. All players can gain guild points by doing various activities, including questing, hunting, gaining titles, crafting, disassembling, digging, fishing, and more. Points can be seen in the bottom right of your profile window, or in the guild window. Players will gain guild points even if they are not in a guild. They can be saved and donated to any guild joined in the future. However, you can only have 3,000 guild points at one time, so in order to gain more you must donate. Points are donated through the guild window, directly under announcements. 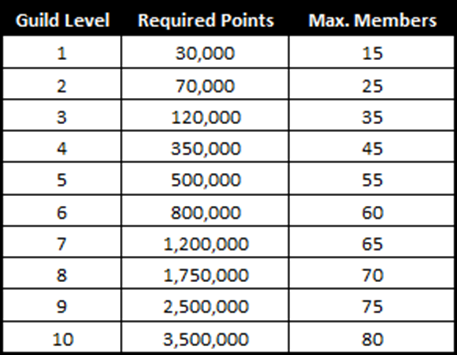 Points donated to the guild can be used to level up the guild, increasing the member capacity and unlocking access to skills and skill level-ups. Please note that the max members before the update was 50. Guilds who already had 50 members can keep them, but will not be able to add more members until reaching Lv5. Additionally, if a player leaves or is kicked out, they will be unable to come back until reaching Lv5. 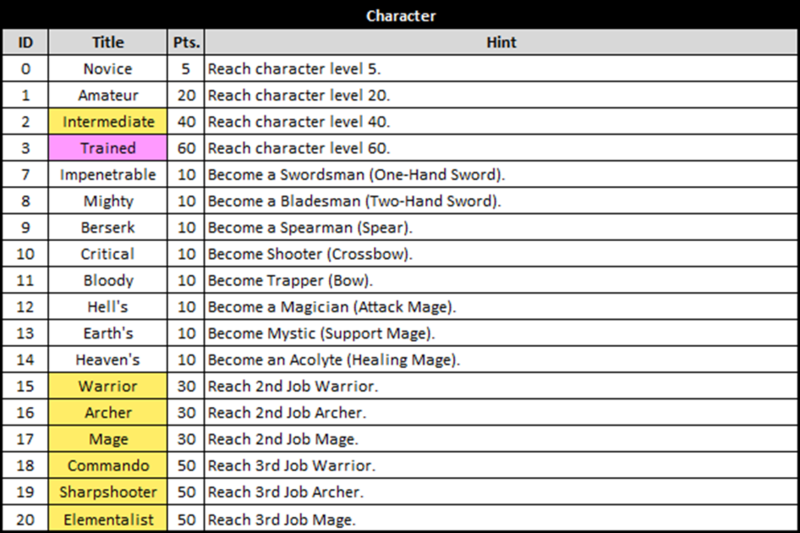 Guild Skills can be learned by using the guild's points. After learning, for the buff to be effective it must be activated by spending more points. Each day at 6am, a maintenance fee will be deducted from the guild's points to keep a buff active. If there are not enough points, the buff will automatically deactivate. 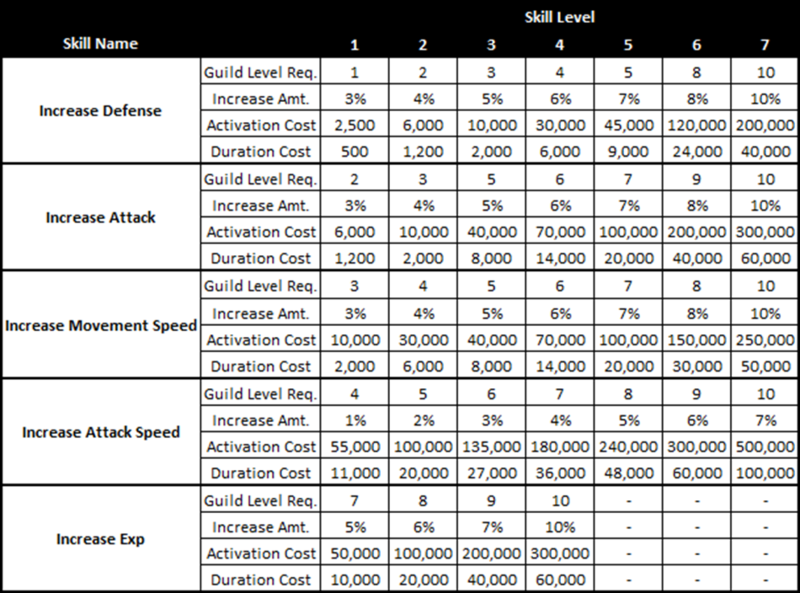 Guilds can conserve points by deactivating skills any time to keep from spending a maintenance fee. However, keep in mind you will need to pay again to reactivate it. It is cheaper to keep the skill active than to deactivate it for a day than reactivate it! For those new to the titles system, it is basically the achievements system for Asda 2. Performing certain actions will allow you to discover new titles, and continuing those actions you will eventually gain titles which you can display above your head. Some titles are easy to gain, while others will take quite some time, effort, and maybe even luck! To those familiar with Asda Story's system, you will see some familiar favorites as well as many brand new titles. Some original titles have had their requirements adjusted to be more fitting of Asda 2. Another difference is that all titles can now also be placed as a prefix or suffix using the buttons, allowing each person to make a unique title all their own! To apply a title, open the titles window and select a single title. Press Prefix or Suffix to place in the desired location. You may select another title and place it in the opposite location if you wish. Press Confirm, and the title will appear above your head. There are over 200 titles to collect, and more on the way as new content, features, and events are released! One of the most exciting updates to the titles system is the all new ranking perks! Players within the top 1000 in ranking will receive bonus stats on their character! Ranking is decided by the total title points you have accumulated. This only includes titles which have been gained. The bonus stats gained are based on your ranking, class, and level. So, for example, a higher level player wil gain a higher amount of stats if they are tied with a lower level player, but the low level player will have a higher bonus than lower ranked players of their own level. The rankings and bonuses will be refreshed at 3am each day. A map change or re-log may be necessary to refresh. You will now be able to show off your achievements on Facebook! The new Facebook Link system allows you to select a title and boast it on your Facebook Wall/Timeline! The Facebook Link system also has three additional functions. Right click an item in your inventory to boast an item and it's details straight to your wall/timeline. After taking a screenshot, the game will ask if you would like to upload the screenshot to Facebook. Doing so will put the screenshot in a new Asda 2 album on your page. 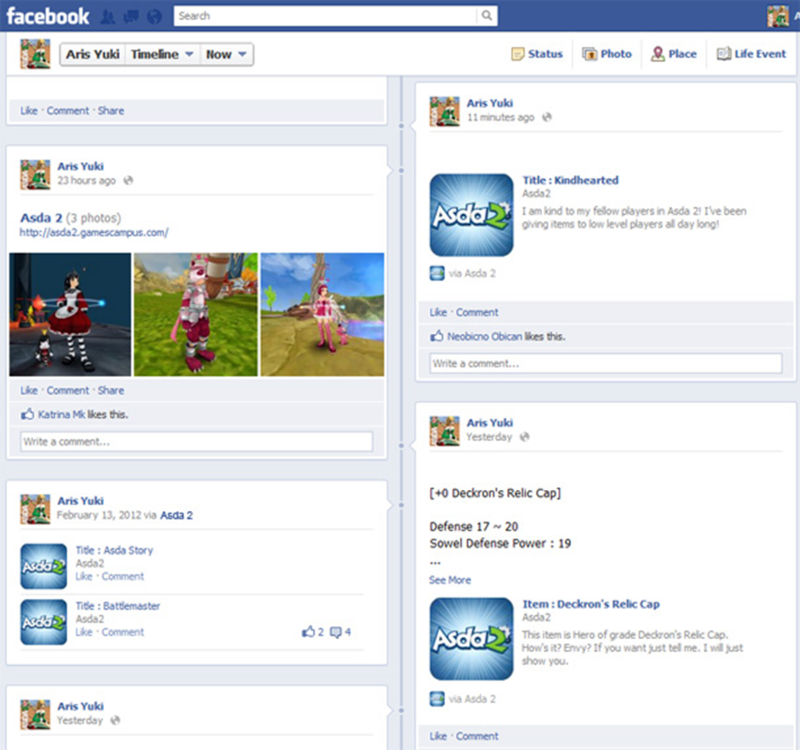 A new Facebook button in the bottom right will allow you to access Facebook in a window directly in the game. Of course, the Facebook Link is completely optional. You must have a Facebook account, and approve the Asda 2 application when it asks to access your profile (as with any Facebook Application). We assure you that this application is secure and no personal information can be gained by us or others by adding this application to your account. Avatars are costume pieces which can be worn at the same time as armor. When wearing avatar pieces it will override the appearance of the corresponding piece of equipment, but the stats of the equipment remain on your character. Avatars can be found by various methods, such as leveling up, by participating in events, or in the item mall. The avatar slots are split in to 9 slots: Head, Chest, Hands, Legs, Feet, Accessory 1, Accessory 2, Back, and Weapon. The Weapon Slot is not currently in use and will be applied in a future update. Accessories are split in to 3 categories: Upper Head, Middle Head, and Lower Head. Only two of these types can be worn at the same time, and only one from each category can be worn. Wearing avatars is as simple as wearing equipment. Simply double click the piece in your inventory and it will be equipped. If "Display Helmet" is turned off, it will also turn off the avatar helmet. Images of all current and previously available avatars can be found on our Facebook album. Premium Tip: Many avatars can be found in the Item Mall. You can buy full costumes (Head, Chest, Hands, Legs, Feet) as packages, and accessories and back pieces separately. There are often limited time avatars available, so keep an eye out! By adding Rune Sockets to a head, chest, hands, legs, or feet avatar piece, it can become a useful tool in boosting your character's strength. Runes are similar to Sowels, but are exclusively for avatars. Up to 2 sockets can be added on each avatar piece (Maximum is 1 for common avatars, 2 for rare). Premium Tip: You can bypass the need for sacrificing an avatar piece by using the “Rune Socket Tool” premium item. Though it has a lower success rate than Rare avatars, the success rate is higher than common avatars. 1. Visit BumiBumi in Alpen and choose the "Rune Socketing" option. 2. Double click the main avatar piece you would like to add a socket to. 3. Select either a second avatar piece or a Socketing Tool. Select a Socketing Supplement if applicable. 4. Press continue, then confirm in the popup window. 5. You will receive a message that your socketing has either succeeded or failed. On failure, your material and supplement will be consumed, but your main avatar will remain in tact. 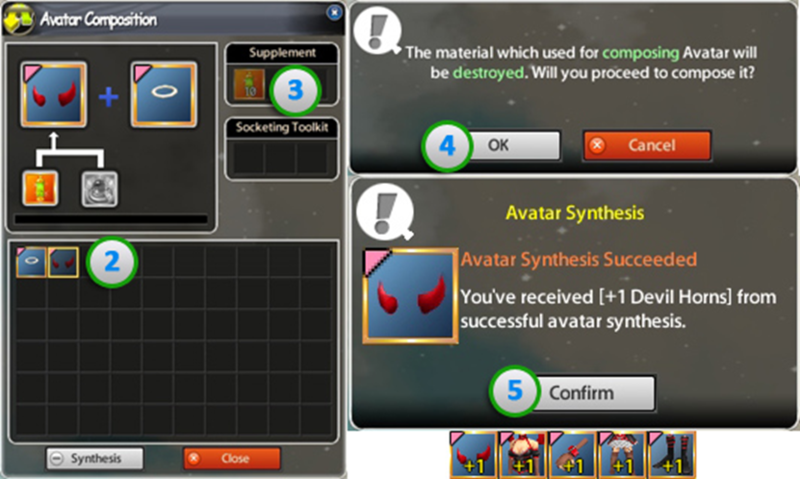 On success, your material and supplement will be consumed, and your main avatar will gain 1 socket (indicated by a +1 or +2 in the item name and on the item icon). 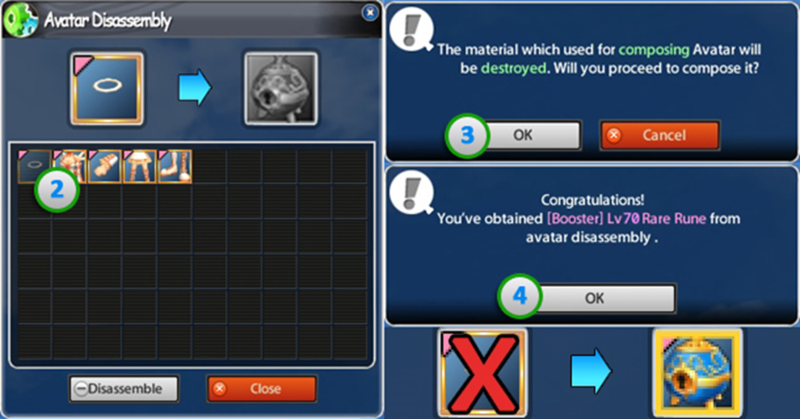 You can increase the rate of socketing success by using the “Avatar Socketing Supplement” premium item. This item will increase the success rate by 30% of the original success rate(i.e. if original success rate was 50%, the new success rate is 65%). There are currently two ways to obtain Runes to put in your avatars: by purchasing them in the item mall, or by disassembling other avatars. Avatar Disassembly If you have an avatar piece which you no longer want, you can disassemble it to receive a rune booster. Disassembling common avatars will produce a common rune booster, and disassembling rare avatars will produce an uncommon, rare, or hero rune booster. The booster's level depends on your current character level. 1. Visit BumiBumi in Alpen and choose the "Avatar Disassembly" option. 2. Double click the avatar piece you would like to disassemble. 3. Press disassemble, then confirm in the popup window. 4. You will then receive a message letting you know which rune booster you have received. The avatar piece will be consumed. Uncommon Runes can be purchased in the Item Mall straight out of the box. 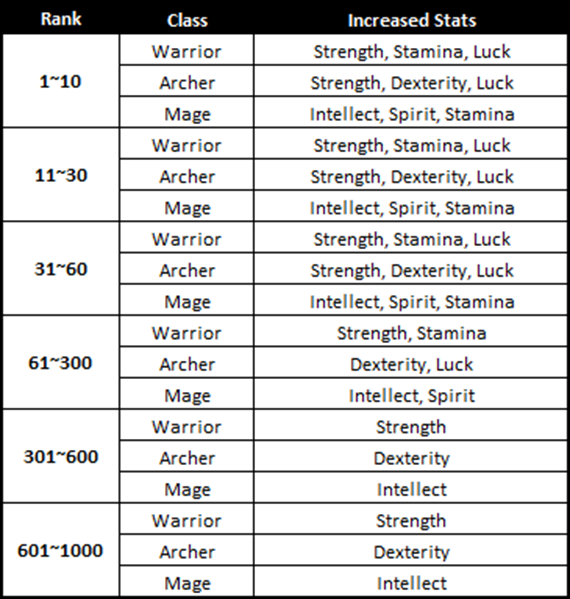 When purchasing uncommon runes, you can choose the type and level suited for your character. Runes can also be purchased in a Rune Booster. This booster has a low chance to receive an uncommon rune, a high chance to receive a rare rune, and a medium chance to receive a hero rune. You can choose the level, but the type of Rune is random. 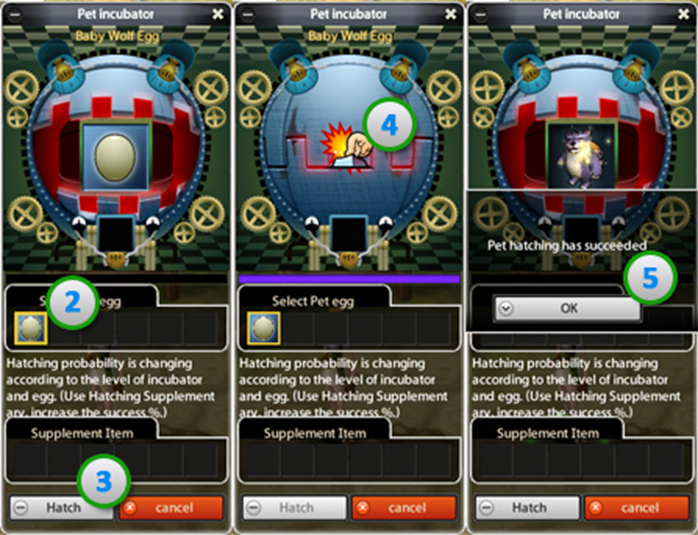 Pet eggs can be received from pet egg boosters, which contain common, uncommon, and rare versions of a specified pet. 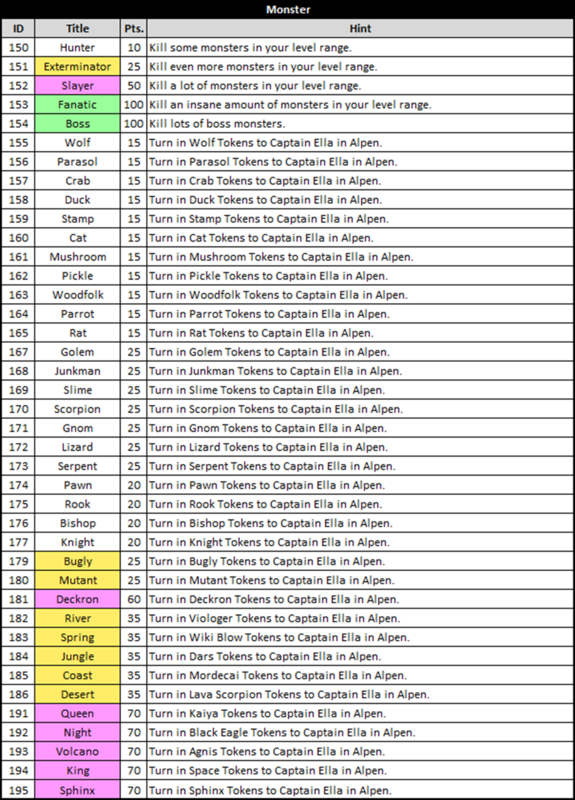 Each type of pet is dropped by different monsters. Generally, they are dropped by monsters that are of similar species. You can find what eggs a monster drops with the Item Encyclopedia in game. Premium Tip: Special pet boosters can also be purchased from the Item Mall. You can get Uncommon, Rare, or Hero pets! Hatching pets requires an incubator. Incubators can be purchased from the Pet Shop NPCs in each town. Three incubators are available: Incubator (Low Hatch Chance, 10,000g), Great Incubator (Medium Hatch Chance, 50,000g), Superior Incubator (100% Hatch Chance, 500,000g). 1. Double click the incubator in your inventory. 2. In the incubator window, select the egg you wish to try hatching. 3. Click the hatch button. 4. Click the animated finger at the top of the window to proceed. 5. You will receive a message that your hatching has either succeeded or failed. On failure, the pet egg and incubator will be deleted. 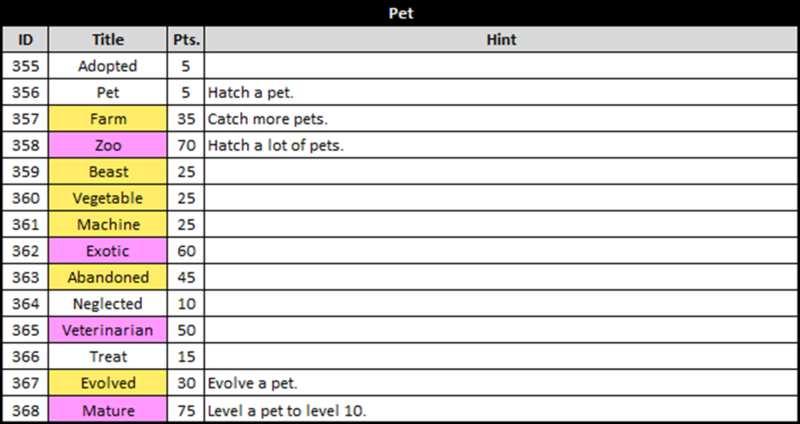 On success, the pet egg and incubator will be deleted and the pet will be added to your pet inventory. Pets will only effect your stats while they are summoned, so be sure to keep them out while in battle! 1. Press the "P" key on your keyboard. 2. Click the "Pet Storage" button in the bottom left of your inventory. 3. Click the "Pets" button in the Misc. Menu. This can also be dragged down to a slot in your hotkey bar. 2. Pet inventory showing all pets you have available. 3. Right click menu for pets, where you can summon and cancel summon. 4. The name of your pet. A pet’s name can be changed one time. Type in the name and press “Change”. 5. 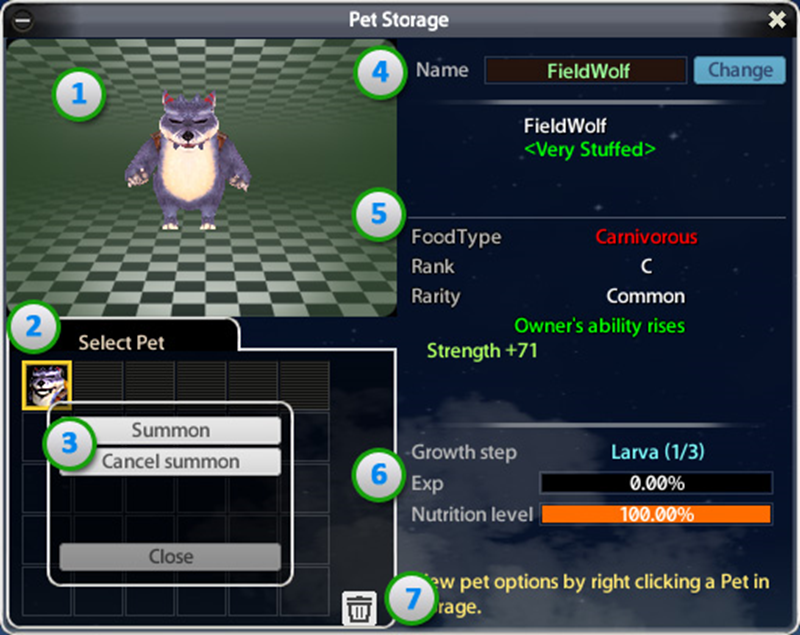 Displays the pet information, such as the type of food it needs and stats it provides. 6. Displays your pet’s current level, max level, EXP, and nutrition level. 7. The trash can lets you delete a pet...but you don’t want to do that, do you? Premium Tip: Normally, you can only have up to 6 pets, but you can expand your pet storage by 6 more each time you use the “Expand Pet Box” premium item. The maximum amount is 30 after 4 expansions. Over time, a summoned pet's nutrition level decreases, meaning they are getting hungry. While this has no negative effects, letting them get to 0% will cause them to faint.The hunger level will go down 1% every 1 minute. Carnivorous pets need meat food, Herbivores need plant food, and Mechanical pets need oil. All pet food can be purchased at the General Shop, and you can use them by double clicking them in your inventory. Premium Tip: You can purchase “Ongoing Pet Food” in the Item Mall, which will keep your pet’s hunger level as is for the duration (meaning it will not faint). You can purchase a 7-Day version, or a pack of five 6-hour foods. When a pet faints, it goes back to the inventory, and you cannot use it until it has been revived. Pets can be revived with the use of a “Pet Revive Potion”, which can be crafted with level 1 crafting. Once you’ve crafted the potion, go back to your inventory, right click on the pet, and try to summon it. It will then ask you if you would like to revive your pet. Once you do, you can use your pet once again and enjoy it's benefits and company. Leveling pets is important to make you stronger. Each level will increase the stats your pet will give you, as well as increase the size of your pet slightly. Also, reaching certain pet levels is required for evolution and synthesis. Over time, pets will gain EXP automatically while summoned, and the amount depends on the current pet level. The EXP will be raised every 3 minutes while the pet is summoned. A pet's EXP can also be raised quickly through the use of Pet EXP Potions, which can occasionally be found through events. Premium Tip: You can double the amount of experience your pet gains by using the “Pet EXP Boost” premium item. It is available in a pack of 5 potions which last 6 hours each. We recommend usng this with the "Ongoing Pet Food" to keep your pet out long enough to make use of the EXP Boost. Each pet has a default maximum level once hatched. This maximum level can be increased using the limit breaking system after reaching character level 30. To use this system, your pet must already be at the maximum level with a full EXP bar. To proceed with limit breaking, you will need a Limit Break Potion. Limit break potions for pets which are Lv3 or Lv4 can be purchased in the Pet Shop. Potions for Lv5 pets can be found by killing field map bosses. The number on the potion corresponds with your pet's current level. Higher level potions will be available in future updates, and may require higher character levels to use. 1. Visit one of the Pet Shop NPCs in any town, and choose the "Pet Limit Break" option. 2. Double click the pet you would like to limit break. 3. Select your Limit Break Potion as well as a Protector if applicable. 5. ou will receive a message that your limit breaking has either succeeded or failed. On failure, your potion and protector will be deleted, and your pet's EXP will decrease by 50%. On success, your potion and protector will be deleted, and your pet's level will be increased to the next level with 0% EXP. 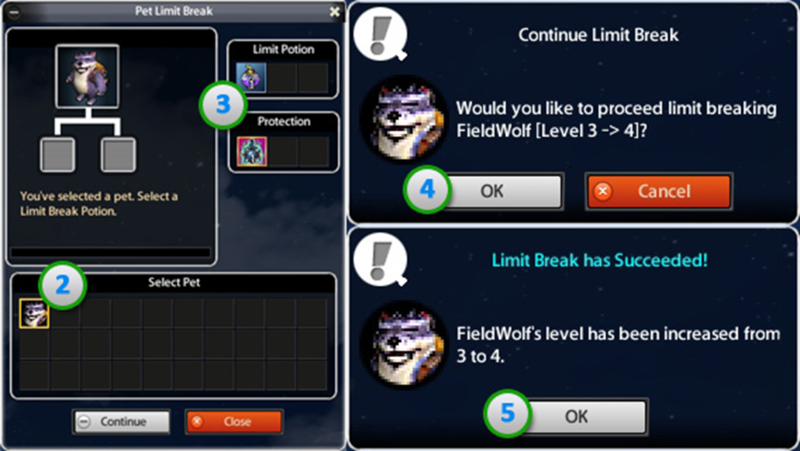 Premium Tip: You can decrease the amount of EXP lost on failure by using the "Pet Limit Break Protect" premium item. This item will decrease the penalty from 50% EXP to 10% EXP. However, it is used up no matter if you fail for succeed the limit breaking process. Each pet which comes from a booster dropped by monsters has 2 evolution stages. Evolving your pet will make it stronger as well as change it's appearance. Because of the pet level restrictions, your character will need to be at least level 30 to perform evolution. Another advantage to evolving pets is that you are able to evolve a pet in to any rank. For example, if you have a FieldWolf, which is normally C-Rank, you could evolve it to A-Rank if your character's level allows. This means any evolved pet can be effective for any level, and you can choose the pet with your preferred stat set or appearance. To proceed with evolution, you will need an applicable "material pet" along with the pet you are evolving. You will also need a Rank Potion from the Pet Shop to decide the rank of your evolved pet. NOTE: D-Rank is for Lv1~19, C-Rank for Lv20~39, B-Rank for Lv40~59, A-Rank for Lv60~79, S-Rank for Lv80~99. When evolving, you must have the minimum level to evolve in to that rank. 1. Visit one of the Pet Shop NPCs in any town, and choose the "Pet Evolution" option. 2. Double click the pet you would like to evolve. 3. Double click the material pet you would like to use. Note: Using a higher rarity main and material pet will increase your chances at a higher rarity evolution. 4. Select your Rank Potion as well as a Synthesis Supplement if applicable. 5. Press continue, then confirm in the popup window. 6. You will receive a message that your evolution has either succeeded or failed. On failure, your material pet, potion, and supplement will be deleted and your main pet stays in tact. On success, your material pet, potion, and supplement will be deleted and your main pet will be evolved. 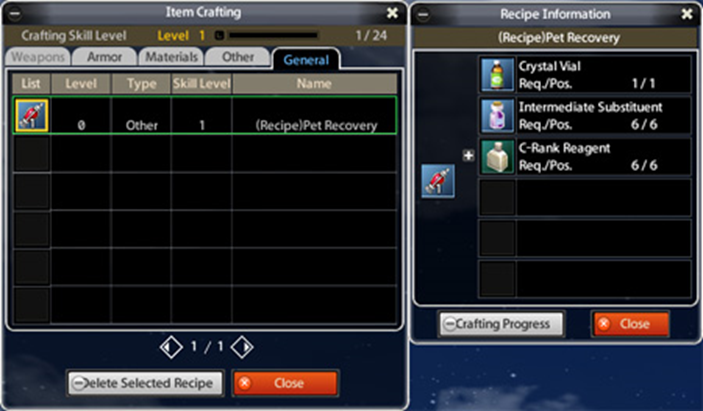 Premium Tip : You can lower the required level of your material pet by using the “Synthesis Supplement” premium item. This decreases the required level of the material pet by 2. To proceed with the 1st evolution, your main pet must be Lv5 or higher. The material pet must be Lv3 or higher (Lv1 with Synthesis Supplement). After successfully evolving, you will receive a Lv4 Rare or Uncommon pet with the Rank of the used Rank Potion. Regardless of receiving Rare or Uncommon, the pet will have 2 stats. Each pet uses different material pets for the 1st evolution. 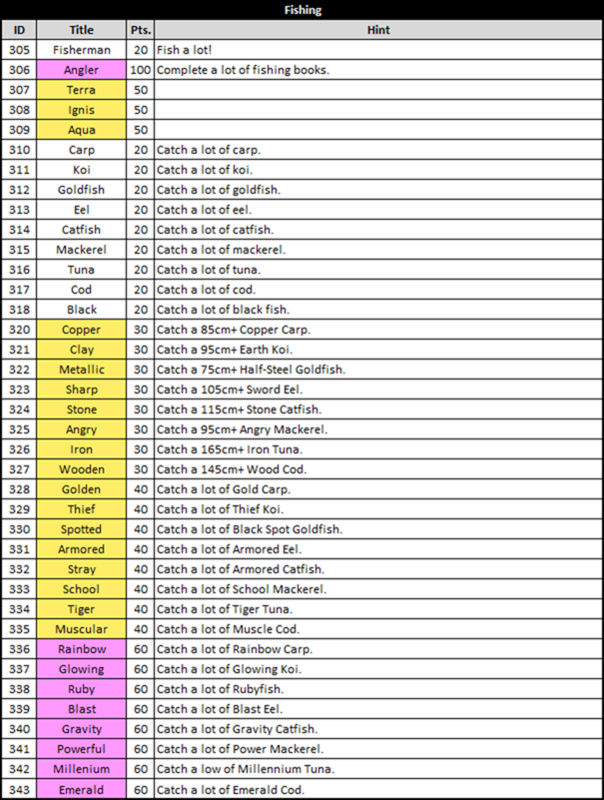 Please see the chart below, or the 1st evolution pet list further below. To proceed with the 2nd evolution, your main pet must already be at the 1st evolution stage with Lv5 or higher. The material pet must be Lv5 or higher (Lv3 with Synthesis Supplement). After successfully evolving, you will receive a Lv5 Hero or Rare pet with the Rank of the used Rank Potion. Regardless of receiving Hero or Rare, the pet will have 3 stats. Each pet uses different material pets for the 2nd evolution, and they are different than those used for the 1st evolution. 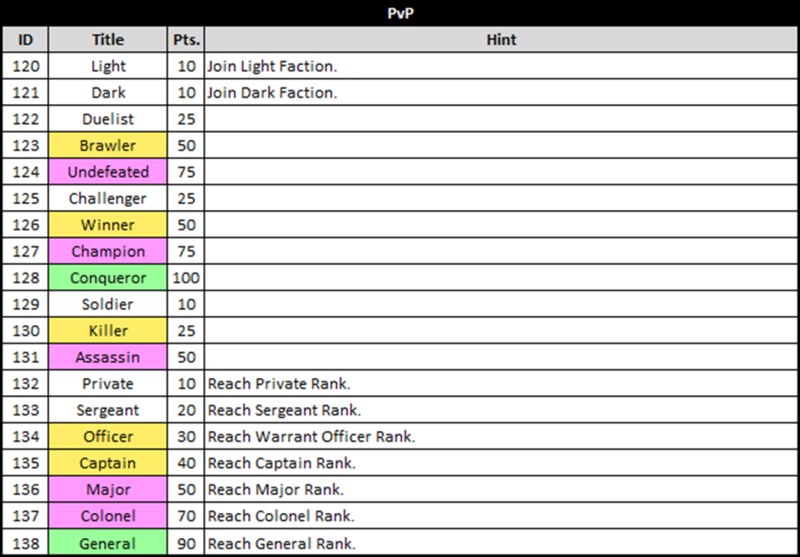 Please see the chart below, or the 2nd evolution pet list further below. Random Synthesis allows you to combine any two pets and change them in to a completely random pet. Some special pets are only available through Random Synthesis, so they are more rare than others. Unlike evolution, using higher rarity material pets does not increase your chance at a better pet. There are also no pet combinations to make a specific pet. It is completely random. Random Synthesis cannot fail. 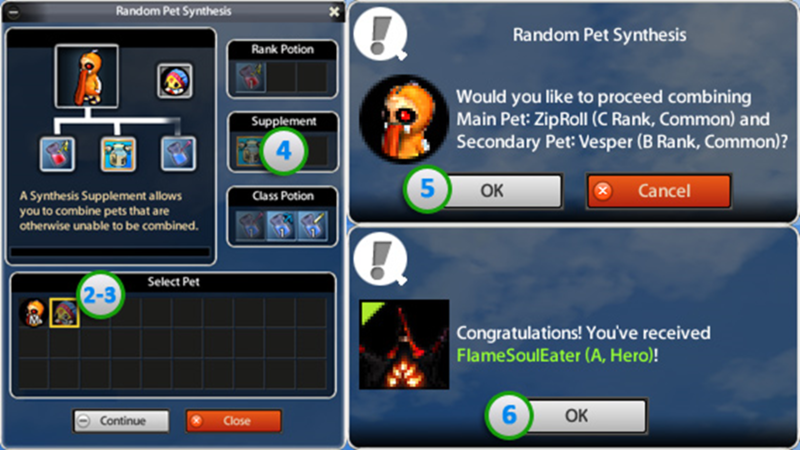 To proceed with random synthesis, you will need two pets at Lv5 (the second pet can be Lv3 using a Synthesis Supplement). You will also need a Rank Potion from the Pet Shop to decide the rank of your random pet. The last thing you will need is a Class Potion, which will decide which list of pets you could obtain. 1. Visit one of the Pet Shop NPCs in any town, and choose the "Random Synthesis" option. 2. Double click the first material pet. 3. Double click the second material pet. 4. Select your Rank Potion, Class Potion, and Synthesis Supplement if applicable. 6. You will receive a message that your synthesis has succeeded, and it will display the received pet. 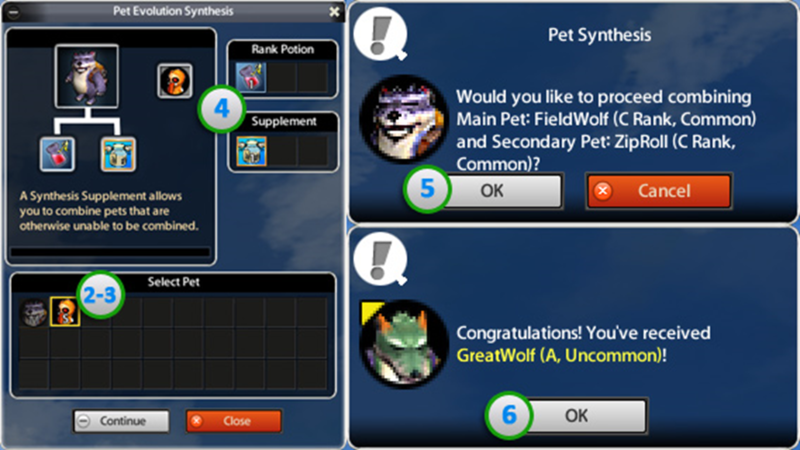 Premium Tip: You can lower the required level of your material pet by using the “Synthesis Supplement” premium item. This decreases the required level of the material pet by 2. A potion for all classes can be purchased at the Pet Shop. This potion will result in a pet of any rarity with stats geared toward being useful for any class. It has a high chance to receive a common or uncommon pet, and a low chance to receive rare or hero pets. A potion for Warrior classes can be purchased at the Item Mall. This potion will result in a pet of uncommon or higher rarity with stats geared toward being useful for a warrior. It has a high chance to receive a rare or hero pet, and a low chance to receive uncommon pets. A potion for Archer classes can be purchased at the Item Mall. This potion will result in a pet of uncommon or higher rarity with stats geared toward being useful for a archer. It has a high chance to receive a rare or hero pet, and a low chance to receive uncommon pets. A potion for Mage classes can be purchased at the Item Mall. This potion will result in a pet of uncommon or higher rarity with stats geared toward being useful for a mage. It has a high chance to receive a rare or hero pet, and a low chance to receive uncommon pets.